back from 2 days of train travel to + from montreal, 3 days in montreal and a day in nyc. arrived back to dc this morning around 3:30am. have oodles of photos and adventures to share but am about to crawl into bed before an early trip out to oklahoma tomorrow morning. family time, here i come with sir louis the pug in tow (in a pink bag, of course). as you know, i've been contemplating a second tattoo. i wanted to wait until i was 100% sure, through with comps (which i passed with a 91.5% - woo hoo! ), and feeling a bit lighter in my load. thus, time away felt perfect and it was spontaneous. i went with the sanskrit version of my favorite mantra lokah samastah sukhino bhavantu as cursive wouldn't fit on one line. funny, looking at that photo of lady gaga in the above link, i see we both are rockin' one shoulder noir tops. i simply wanted to stay warm so i pulled one arm out of my 2in1 fitted tee and added my long sleeve wrap tunic to stay cozy. i did recall her donning sunglasses and decided it would be best to block out the overhead lights and make the experience, well, more tranquil. a lavender eyepillow, cup of chamomile tea, and nag champa incense would have been even better. was it painful? insanely so, but super quick! considering last year's surgeries where pain lingers for months, this was much easier (but anesthesia would have made it even more doable!). it was throbbing for a couple hours afterwards but feels good as new now. the process took 45 minutes to an hour and i was squeezing le beau's hand most of the time while doing lion's breath (and occassionally squealing - to which i was shushed by my artist). when i left i had red lipstick all over my mouth for all my lion's breaths - not pretty. we stayed at the rockstar hotel chelsea (sans bathroom in room) so i chose the next door parlor chelsea tattoo company. hip hop and punk music played in the background. i requested air supply but the artist was unfamiliar with my fave old school band. i know, i know, but i heart "lost in love." don't you? happy with my new ink. it marks my half-way through MSW program, comps congrats, and a continual reminder to "may all beings everywhere be happy and free. may the thoughts, words, and actions of my own life contribute in some way to that happiness and to that freedom for all." love! wishing you a tranquil conclusion to cinco de mayo. excited to crawl into bed. OmGanesha love the tat. Safe travels to OK ... Love to Momma Wilson!!! love the new tattoo! i'm even more inspired to get my second one. I love the tattoo. The artist did a great job with the "lettering", although how does one not know of Air Supply? Safe travels to OK, and blessings to you and your family. Love it! I heard this mantra through one of your former podcasts I really love it a lot, thanks for the link I printed it out and put it up above my desk and will put one in my journal! Love the tat! LOVE the inkage! And you're just encouraging me to want more and more! I've already got a design in my head ... a lotus flower with "follow your bliss" in script above, and the kanji symbols for "beauty" and "soul" below. 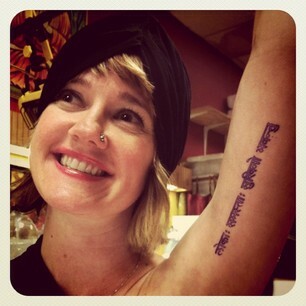 Then I was going to get "namaste" in sanskrit done on the base of my neck.